Here's a recipe I often serve in the winter time since it's warm, creamy smooth, delicious, and very healing to the body since it's made with a bunch of powerful Chinese tonic herbs. 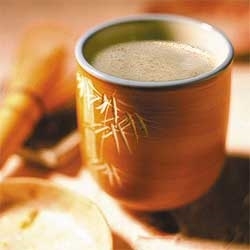 Chai traditionally is a mixture of tea and milk or cream. This chai uses nut milk and is every bit as creamy as dairy. You can find the herbs online and in some oriental herb stores or groceries, but beware, if they're not labeled organic they may have toxic chemicals in them. Read labels and ask questions. A good source is ShamanShack.info; their high quality Three Treasures organic herbal tea mixes are ready to go, taste great, and can be used easily instead of buying all the ingredients separately and weighing them out. Otherwise search online for "organic" in front of each herb name. eBay often has bulk organic Chinese herbs. Because the ingredients can come in different forms and are very light, they are weighed in grams, which most kitchen scales will measure. TO BREW THE TEA Soak the herbs in 8 cups of water for 30 minutes. Cover, bring to a boil and leave at moderate heat for 30 to 45 minutes. Let cool until warm but not hot. You can leave the same batch of herbs in the pot when making a second batch, the first batch will still have some flavor left. NUT MILK DIRECTIONS This is a drink for special occasions, not daily drinking, because the combination of nuts and sugar is a poor combination that ferments in the gut, but for a very OCCASIONAL treat, the wonderful creaminess and chocolate flavor are very much like hot cocoa. It’s a great treat that will impress even non-raw friends. For vanilla nut milk, leave the cacao powder out and increase the vanilla bean powder to 4 teaspoons. Blend all ingredients in a high-speed commercial blender until smooth, creamy, and warm. Only a high-speed blender will have enough speed to warm the milk and make it creamy. TO MAKE CHAI Mix about 5 parts tea to 1 part nut milk and stir. Can add more or less nut milk or sweetener to taste. You can leave the agave or honey out altogether and use Stevia only. Enjoy!